This project applies knowledge about urban micro climates in Sydney, Melbourne and Adelaide. It aims for a sharing of information about urban micro climates between cities. It outlines characteristics of urban micro climates, and aims to produce an effective way to monitor and record information about micro climates for use by planning agencies, service providers and developers. Since its launch in 2012, the CRCLCL has worked closely with industry and government to generate an authoritative body of research to help keep Australian cities cool. A range of policy recommendations are presented here across the four disciplines of public health, building and construction industry, and urban planning and infrastructure - emerging from CRC for Low Carbon Living (CRCLCL) project research findings related to heat stress in urban Australia. RP2005 Journal Article: Heat stress risk and resilience in the urban environment. Hatvani-Kovacs, G., Belusko, M., Skinner, N., Pockett, J. & Boland, J., (2016). 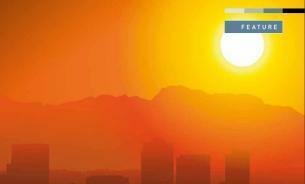 Heat stress risk and resilience in the urban environment. Sustainable Cities and Society, 26, p.278–288. Hatvani-Kovacs, G., Belusko, M., Skinner, N., Pockett, J. & Boland, J., (2016). Drivers and barriers to heat stress resilience. Science of The Total Environment, 571,p.603–614. RP2005 Report: Does the Australian Nationwide House Energy Rating Scheme ensure heat stress resistance? Hatvani-Kovacs, G., Belusko M., Pockett, J., Boland J., 2016, Does the Australian Nationwide House Energy Rating Scheme ensure heat stress resistance? 20 pp. Sharifi, E., Sivam, A., & Boland, J. (2016). Resilience to heat in public space: a case study of Adelaide, South Australia. Journal of Environmental Planning and Management, 1-22. 2016 article ‘Turnbull government's plan to make cities cooler and greener’, Melbourne (19 Jan. 2016) by Nicole Hasham, The Age. 2015 article ‘Blowing hot or cool depends on where you're at, says urban microclimate expert’, Sydney (20 Nov. 2015) by Catherine Armitage, Sydney Morning Herald. 2015 Press release 'A super cool roof solution to being hot in the city' (28 May 2015) from UTS Newsroom. February 2016 article, Ecolibrium, pp. 15-18.